Posted by Dave Emory ⋅ June 29, 2014Post a comment Email This Post Print This Post Tweet This! Introduction: Continuing our ongoing coverage of the Ukrainian crisis, the program begins with an examination of the continuity of the OUN/B Third Reich collaborationist milieu through the decades. The “new” President Petro Poroshenko is advised by a team of political vetarns, culled largely from the political team of Viktor Yuschenko. In FTR #781, we noted that Viktor Yuschenko–married to top OUN/B official and Reagan Deputy Director of Presidential Liaison Ykaterina Chumachenko–institutionalized the Bandera political cadre, rewriting Ukrainian World War II history and paving the way for the rise of Swoboda and Pravy Sektor. The Poroshenko/Yuschenko team includes Roman Zvarych (“Svarych”), the personal secretary to OUN/B head Jaroslav Stetsko and a right-hand man to his widow and successor Slava Stetsko. Svarych served as Minister of Justice in both Tymnoshenko governments, as well as under Viktor Yuschenko. The Congress of Ukrainian Nationalists, co-founded by Slava Stetsko and Zvarych, has served as a central element in Ukrainian political coalitions, embodying the continuity of the OUN/B throughout the short history of post-Soviet Ukraine. While this process is taking shape, the war in Eastern Ukraine has escalated, with armor, artillery, helicopter gunships and fixed-wing combat aircraft being used against the population there. Imagine if Yanukovich had resorted to such tactics with the Maidan coup gaining momentum! Poroshenko has retained founding Swoboda member Andriy Parubiy as the country’s top defense official. Underlying EU/German/U.S. policy in Ukraine is an apparent destabilization program aimed at the Russian economy and President Putin. Program Highlights Include: Discussion of the Congress of Ukrainian Nationalists’ evident anti-Semitism; the Congress of Ukrainian Nationalists’ endorsement of Ze’ev (nee Vladimir) Jabotinsky in an attempt to deflect charges of anti-Semitism; review of the fascist character of Jabotinsky and his Betar organization; Ukraine’s brutally ironic proposal to build a wall separating it from Russia–a “Berlin Wall Redux;” the fact that Ukrainian president Poroshenko is leaning toward giving government entitlements to veterans of the UPA–the Nazi collaborators comprising the military wing of the OUN/B. 1a. In FTR #781, we noted that Viktor Yuschenko–married to top OUN/B official and Reagan Deputy Director of Presidential Liaison Ykaterina Chumachenko–institutionalized the Bandera political cadre, rewriting Ukrainian World War II history and paving the way for the rise of Swoboda and Pravy Sektor. We now learn that “new” Ukrainian President Petro Poroshenko has reconstituted the old Yuschenko team, including American-born Roman Zvarych (“Svarych”), Yuschenko’s Minister of Justice and the personal secretary to OUN/B leader Yaroslav Stetsko in the early 1980’s. As discussed in FTR #800, Poroshenko has basically reconstituted the old Yuschenko team, including Jaroslav Stetsko’s personal secretary, Roman Svarych. Yuschenko, in turn, manifested an OUN/B revisionist agenda, as discussed in FTR #781. 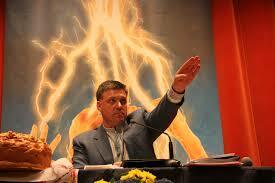 Svarych was his Minister of Justice, as he was during both Tymoshenko governments. “OUN-UPA Veterans Could Be Given Combatant Status—Poroshenko”; Interfax-Ukraine; 9/25/2014. 2b. Excerpting Miscellaneous Archive Show M30, the program sets forth the fascist ideology of “Ze’ev” (nee “Vladimir” Jabotinsky). (The program was recorded in the fall of 1983.) The text is excerpted from Alexander Cockburn’s article “History as the Propaganda of the Victors” in The Village Voice of 10/12/1982. In FTR #776, we reviewed the dis­cus­sion of a 1998 con­gress of the AN, the Ital­ian Fas­cist Party that is the direct lin­eal descen­dant of and heir to Mussolini’s black­shirts. Present at that meeting were GOP Representative Bob Young, representing the Republican Party, and Udi Cohen, representing the Likud Party of Benjamin Netanyahu. (This excerpt is taken from FTR #94, recorded on 5/5/1998.) Netanyahu’s father, Benzion Netanyahu, was the personal secretary of Vladimir Jabotinsky and a pallbearer at his funeral. “For Peace and Freedom;” german-foreign-policy.com; 5/30/2014. More reports and background information on the current German policy toward Ukraine can be found here: A Broad-Based Anti-Russian Alliance, Expansive Ambitions, Our Man in Kiev, Integration Rivalry with Moscow, On the Offensive, At all Costs, The Crimean Conflict, The Kiev Escalation Strategy, Cold War Images, The Free World, A Fatal Taboo Violation, The Europeanization of Ukraine, Official Government Vocative, An Unusual Mission, “Scientific Nationalists”, Crisis of Legitimacy and “Fascist Freedom Fighters” and The Restoration of the Oligarchs (IV). 4. Ukraine’s politi­cians are start­ing to hint at a plan for deal­ing with sep­a­ratists in the east: build a giant wall. The irony of this is more than a little ironic. Note that Swoboda’s Andriy Parubiy still heads the Security Council, in charge of military operations. “As Ukraine Mulls Secu­rity, Some Say Build a Wall with Russia” by Tim­o­thy Heritage; Reuters.com; 6/17/2014. “Insistence on Austerity Could Derail Ukraine’s Chance of Survival” by Mark Weisbrot; The Deseret News; 6/1/2014. “Energy as a Weapon (II)”; german-foreign-policy.com; 6/23/2014. Robert D. Blackwill, Meghan L. O’Sullivan: America’s Energy Edge. The Geopolitical Consequences of the Shale Revolution. Foreign Affairs March/April 2014. See Energy as a Weapon. 1. Zionist revolutionary Vladimir (Ze’ev) Jabotinsky, founder of both Betar and the Irgun, was born and raised in Odessa, now in Ukraine. At that time, Odessa had the largest community of Jews in Russia and was a center of the Zionist movement. It was known as the “Gateway to Zion”, where Jewish colonists disembarked for Palestine. 2. The Ukranian oligarch Igor Kolomoisky, appointed provincial governor by coup sponsor and fellow billionaire Victor Poroshenko, is also the founder of the “European Jewish Parliament” (see Wikipedia, note Jewish star on European flag). The European Jewish Parliament appears to be something approximating a joke, with people like Pee Wee Herman having been nominated as “Parliamentarians” without even being notified. Odd you would focus on something as marginal as this. Ukrainian Prime Minister Arseniy Yatsenyuk resigned after two parties quit the ruling coalition and President Petro Poroshenko signaled his support for early elections. Yatsenyuk told the parliament in Kiev today that he’s stepping down after losing his allies’ backing and failing to pass legislation. Former world boxing champion Vitali Klitschko’s UDAR and Svoboda, a nationalist group, said they’d leave the coalition and seek a snap parliamentary ballot, according to statements today on their websites. Yatsenyuk’s administration took charge of Ukraine in February after pro-European street protests prompted Kremlin-backed President Viktor Yanukovych to flee. Since then, the government has battled a pro-Russian insurgency in the east of the country, which it says is supported by the government in Moscow. Russia also annexed Ukraine’s Black Sea peninsula of Crimea in March. “All opinion polls and direct talks with the people show that society wants a full-power reboot,” Poroshenko, who has pledged to call parliamentary elections this year, said in a statement on his website. Ukraine’s parliament must approve Yatsenyuk’s resignation, according to the constitution. The breakup of the coalition “was probably agreed on by political parties seeking elections and the president,” Yuriy Yakymenko, the head of political research at Kiev’s Razumkov Center, a non-governmental policy group, said by phone. Ukraine obtained a $17 billion loan from the International Monetary Fund in May to stay afloat as its economy may contract 6.5 percent this year. The hryvnia lost 29.75 percent versus the dollar since the beginning of the year, according to data compiled by Bloomberg. The government expected lawmakers to approve changes to the 2014 budget, which envisages social-spending cuts and army spending increases, needed to qualify for the IMF’s next tranche. The 450-seat legislature rejected putting the amendments on the agenda. The parliament also rejected a cabinet law on a joint venture to operate the country’s gas transportation system. (Reuters) – Ukraine’s prime minister has launched what promises to be a bitter election campaign that could divide pro-Western parties and complicate their efforts to fight pro-Russian rebels in the country’s east. Prime Minister Arseny Yatseniuk, a key interlocutor of the West during months of turmoil, announced on Thursday that he would quit, saying parliament was betraying Ukraine’s army and people by blocking reforms supported by Western backers. His move, following the exit of two parties from the ruling coalition, amounted to the start of a campaign for seats in a legislature still packed with former allies of pro-Russian President Viktor Yanukovich, ousted by protests in February. “History will not forgive us,” Yatseniuk told parliament on Thursday, in what analysts said was the first campaign speech for the party led by Yulia Tymoshenko, a rival of President Petro Poroshenko, who was elected to replace Yanukovich in May. Pro-Western political forces in Ukraine have been bitterly divided almost continuously since the country won independence with the breakup of the Soviet Union in 1991. Any further divisions will likely weaken Kiev’s attempt to counter Russia’s reassertion of control over the former Soviet arena, realised most dramatically when Moscow annexed Crimea from Ukraine in March, and may also complicate talks with governments which lost citizens in last week’s downing of an airliner over eastern Ukraine. Analysts said his removal from office – which has yet to be approved by parliament – would allow his party to criticise government policy during the campaign. Abandoning his post at a time when Ukraine is struggling to finance a war against pro-Russian rebels in eastern Ukraine and to pay state workers their regular salaries could be a high risk strategy for Yatseniuk. Government and finance officials have warned that the budget only has enough money to finance the army until Aug. 1, and some pro-Russia politicians have criticised the government for failing to properly feed or equip soldiers in the field. An aide to Poroshenko, Oleksander Danilyuk, said the resignation should not hurt what Kiev calls its “anti-terrorist operation” against rebels in eastern Ukraine. In the rebel stronghold of Donetsk, witnesses said artillery fire could be heard from the direction of the airport for the third day. There were fewer people on the streets. Local health officials said 14 people had been killed in the last 24 hours in the Donetsk region. Northwest of the rebels’ second stronghold of Luhansk, Kiev said it had taken the town of Lysychansk. The war will be central to the campaign and Yatseniuk needs distance from government policy to form a campaign in opposition to Poroshenko’s leadership said. Poroshenko, who has been in various governments over the years, is a pro-Western businessman, one of the first Ukrainian politicians to visit the protest camp in Kiev. He has never engaged in name-calling with Tymoshenko, who repeatedly referred to him as an oligarch during campaigning for the presidential election. Tymoshenko has seen her personal ratings and those of her party slip since she was imprisoned by Yanukovich for abuse of office and hopes Yatseniuk can help the party recover. Ukraine’s most popular political group is now the populist Radical Party, led by Oleh Lyashko, and the Udar (Punch) party of former boxing champion Vitaly Klitschko runs third, in the opinion polls. Tymoshenko’s party is second. “Clearly there will be an attempt to shift responsibility for the situation in the country,” Yakymenko said. It looks like Ukraine’s politics is about to a lot more “Radical”. Ukrainian Prime Minister Arseniy Yatsenyuk announced on Thursday that he plans to step down after the populist Udar and far right Svoboda parties withdrew from the coalition governing the war-torn country. As fighting around the rebel stronghold of Donetsk intensifies and the civilian death toll rises, the government in Kiev can scarcely afford more obstacles to its decision making. Amid the political chaos, corrupt opportunists stand to gain the most. Yatsenyuk called on Svoboda and Udar to nominate an interim Prime Minister to serve until new parliamentary elections can be held next fall. The fact that these two parties, respectively known for virulent anti-Semitism and corruption, are now wielding such power should be concerning for those who placed hope in the progressive elements within last winter’s Maidan protests. Svoboda, whose leader garnered just over one percent of the vote when he ran for president against Poroshenko in May, is notorious for promoting anti-Semitic views and praising Ukrainian insurgents who killed thousands of Jews during World War II. The Udar party, headed by former boxer Vitali Klitschko, advocates for reform but is “increasingly known for engaging in backroom deals and shutting other Maidan leaders out of power,” according to an editor for Belarus Digest Devin Ackles. Yatsenyuk, a pro-Western technocrat, made the decision to quit after weeks of parliamentary deadlock surrounding two highly divisive issues: allowing U.S. and E.U. companies to manage Ukraine’s aging gas facilities and ramping up military funding for Ukraine’s ongoing civil war with separatists in the east. He warned parliament’s failure to act risked the new government losing the support of the thousands who protested as part of the Maidan movement that toppled ex-President Yanukovych last February. “History will not forgive us,” he warned. President Poroshenko welcomed the collapse of the coalition that had been struggling to agree on new policies. Under Ukrainian law, the withdrawal of Svoboda and Udar allows the president to dissolve the parliament until elections can be held next fall. “Society wants a full reset of state authorities,” Poroshenko said in a statement released Thursday. While Ukraine elected a new president in May, many parliamentarians are holdovers from elections that occurred before Yanukovych fled the country. Critics allege that the withdrawal of Svoboda and Udar was planned to allow Poroshenko’s administration to silence dissenting voices in government. On Wednesday, after an MP from Yanukovych’s Party of Regions called attention to the killing of civilians by the Ukrainian military, right wing parliamentarians started a fistfight. The government shake-up also threatens to elevate the popularity of right-leaning nationalist politicians and parties that definitely strike a different tone from the pro-Western Maidan protestors who called for a more liberal, open society during last winter’s protest. While Ackles says recent polling suggests Svoboda will not recapture the 10 percent of votes it claimed in the last elections, its role in deciding the new prime minister gives it dangerous, oversized influence in shaping the interim government. Lyashko’s meteoric rise to fame, Svoboda’s sway over recent events, and the general breakdown of any semblance of working order in the current government all suggest that even if Kiev manages to defeat the rebels in Donetsk, Ukraine might not have transformed all that much from the days of Yanukovych. And if the pro-Western government of Petro Poroshenko ultimately fails to meet the demands of the disaffected protestors who sparked the current tumult by pushing Yanukovych from power last winter- essentially fulfilling Yatsenyuk’s warning -these same discontents may increasingly turn to radical parties and leaders for solutions. Army Col. Steve Warren, a Pentagon spokesman, said rounds were fired again on Ukrainian military targets Thursday in a “clear escalation” of hostilities. The Pentagon’s top officer called the Russian shelling of Ukrainian army positions reflects President Vladmir Putin’s “very aggressive” pursuit of objectives in Europe. “We have new evidence that the Russians intend to deliver heavier and more powerful multiple rocket launchers to separatist forces in Ukraine and have evidence that Russia is firing artillery from within Russian to attack Ukrainian military positions,” State Department spokeswoman Marie Harf told reporters. Ukraine’s government has also charged that the missiles that brought down two Ukrainian attack planes over rebel-held areas on Wednesday were fired from Russian territory. U.S. defense and intelligence officials said they could not verify the claim.